Me by the pyramid entrance of the Louvre. 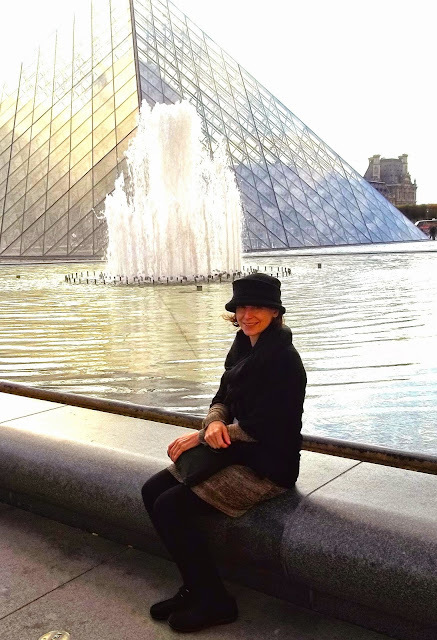 I just got back from my 50th birthday trip to Paris with my husband... yes just the two of us. I have never been so far away from the kids. I had a freak out moment... but I got over it very quickly and had a romantic time with my husband. I promise to post photos, but right now I have to dig my way out of the laundry. The house is in pretty good shape considering it was supervised by my 22 year old nephew with a 13 year old for a chef. Thank you all for the wonderful birthday wishes... it really was the most special birthday I've ever had. I've been with my husband for 25 years and I didn't think he could surprise me... well, he did! Happy birthday Diane. What a great surprise IIt doesn't get any better than celebrating your birthday in Paris. just happened to have made Beef Bourguignon to welcome you home. One of my favorites and it was often on the menu in Paris. Thank you so much Catherine it was a blessed and beautiful trip. So glad your special Birthday In Paris was a wonderful experience for you, what a wonderful memory. Hope you are enjoying your weekend at home and thanks so much for the party. I tried to live it up as much as I could after I read your advice last week... we had a super time. Thanks Linda good to see you. I just knew you were in Paris and am so glad to know it was wonderful. It's a fabulous start to Year 50. Definitely following in the FFWD tradition. Thanks Adelina I hope when your kids get bigger you'll get to visit your brother in Belguim. Good food there. Your husband really knows how to plan a surprise! So glad you had a wonderful time! The 50th should be memorable. I agree 50th birthday is a big one and I was truly shocked when he told me we were going to Paris. So glad you enjoyed your 50th so much. Thanks for hosting the party. It was fun and it is good to be home too. Happy belated birthday - your trip sounds wonderful! It was a wonderful trip. I will post some pictures. Just going through them all. I hope to have some pictures together for my monday post. Some of the best food I had was in the Jewish Quarter...yummy fish and sauerkraut. Glad you were able to enjoy your trip. Happy Birthday! !